Seen at the recent NAB 2013 - Showstoppers 2013 event, the Padcaster is a very clever device that makes it easier to capture high quality video and audio with your iPad. Holding an iPad straight out with your arms is a trying task - it is very difficult to keep the iPad at the right angle - it is even more difficult to keep it steady. A cool device like the PadCaster makes it much more convenient. Even better, by using the Padcaster, you can connect a variety of accessories to your iPad and even lock it down onto a tripod or other types of camera support systems. You can attached a microphone or pole, wireless mike transceiver, lights, video monitor, etc. You can use their Lenscaster accessory to attach a variety of extra lens to your iPad to provide a range of cool and unique shooting options. 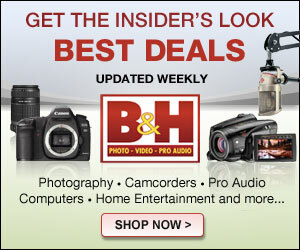 This includes adding wide angle lens, special effects lens or even a telephoto lens. 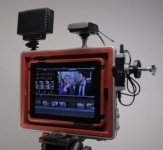 The Padcaster & Lencaster Combo for iPad 2nd, 3rd & 4th Gen is designed to allow you to improve the quality of video shot using an iPad 2nd, 3rd or 4th Gen. The lightweight, brushed aluminum frame has 1/4-20 and 3/8-16 threaded holes around all edges for attaching external microphones, lights and other accessories. This allows for greater creative control over filming. A black urethane insert allows the iPad to fit snugly into the frame. The Padcaster can also be attached to a tripod, monopod or shoulder mount using the tripod thread and locking-pin hole. By removing the insert, you can use the frame as a DSLR cage for added versatility. The included Lenscaster has a built-in 72mm thread that allows you to attach an SLR lens when used with a 35mm adapter (sold separately) to adjust the focus and depth of field. If you have a lens with a rear thread of 58mm, you'll need a step-up ring (sold separately). A 72-58mm step-down ring is included with the Lenscaster. When working with the built-in fixed lens of an iPad, different close-up filters can be used in front of the 35mm adapter with a lens connected to the end. SRS-Tech PR launches new technoloigies and companies. 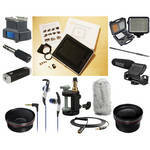 Get the Padcaster and Lenscaster Kit Here - Just $149.